About 1,000 people have been evacuated from Debaltseve, Donetsk region, Ukrainian Prime Minister Arseniy Yatseniuk has announced. "Six buses are now working there. They are constantly under fire. Whenever they see that we are evacuating people, they start firing," he said at an extraordinary Cabinet session on Saturday as quoted by the government press service. He said that at night he ordered the State Service for Emergency Situations to urgently evacuate people from Debaltseve. He said that nobody was hurt in the process of evacuating about 1,000 people. During the night 27 children and 44 elderly people who cannot move unaided were transported away from the dangerous area. 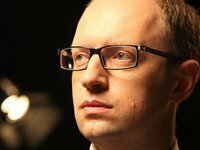 Yatseniuk instructed Defense Minister Stepan Poltorak to guarantee "the cover of the evacuation of people from Debaltseve." "The situation is very complicated, of course. But in this situation it is vital that everyone would do their jobs," he stressed. He said that the state commission for emergency situations would meet next week. There has been stubborn fighting in the area of Debaltseve in the past few days. The Ukrainian army claims it controls the town while the militia reports that it has encircled it and that up to 8,000 Ukrainians servicemen are trapped in the Debaltseve pocket.